I think I've never been more excited that Fall has arrived! I don't know if it's because I'm over the summer or because Fall is a perfect time for experimenting and playing with clothes. One thing is sure, I'm soo inspired and ready to rock all autumn and winter looks. There is going to be a lot of different and interesting content on the blog. I'm so happy with the fact that my style evolved, from cute girl to a vintage ladylike. With that being said, I feel much more confident to try out new and different styles of clothing. If you lack inspiration for Fall and Winter, you came to the right place because I will try to lead you through some of my favorite trends in hope that I will inspire some of you! One of my first and favorite trends are SUITS! I'm so obsessed with them. There are so many variations of this trend, from pajama suits, classic tight ones, and the masculine ones. I already started wearing them. You could saw on my Instagram profile how I wore navy velvet blazer. It's so feminine and elegant. I adore that vintage and classy touch that it has. Can't wait to show you whole look on the blog! Velvet is definitely my favorite material when it comes to suits. I'm preparing you a visual story with a big and masculine suit! I'm super excited about that one because I want to show you how you can rock it in a feminine way. Stay tuned for it! I'm loving this trend so much. Even though I'm not the biggest fan of huge earrings, I'm wearing a modified version of it. Small but in a way big earrings, you can see here what I mean (80s statement earrings on a clip). I think they lift every outfit while giving it a chic touch. I must say, these days I am on a hunt for huge earrings. I'm looking for very specific ones (displayed on collages), so if you saw something similar, don't hesitate to tell me in the comment section! We are talking about beret and vintage inspired hats. This is a proof that fashion never gets old! This is one more old - new trend. I'm so happy that it's back. I remember how a few years ago, I felt silly for wearing beret and now it's such a huge trend! It's a very cute and chic accessorize. If you ever want to feel like a real Parisian, don't forget to throw a beret on your head! It goes perfectly with everyday looks and it looks super stylish! If beret feels too feminine for you then try to wear a biker hat. It's a bit edgier accessorize, but it can also be super girly. Options are endless! This one is for brave ones! It's a bit risky to experiment with leopard because it can look cheap, but that shouldn't stop you from wearing it. There is one rule when you are wearing a leopard print, you should only wear one piece of clothing that got leopard print in it. You don't want to overmatch everything with wearing for example leopard dress, shoes and bag. Pay attention that leopard print is made from quality material and that the color of it is normal. You should avoid neon or bright colors on it! There isn't much I can say about this because I'm totally crazy about statement shoes, metallic or glitter ones, just name it and you know I'll love it! You could see from my previous posts how much I love this trend. I think that even if you aren't so crazy about statement shoes you should have at least one pair of them. Don't be afraid to experiment, it's going to be so refreshing! For this trend goes the exact same thing for what I said for vintage hats, fashion never gets old! Now I feel kind of sorry that I removed pads from a lot of blazers that I have. I loove this trend. I think it's at the same time very feminine and masculine. It's up to you how you are going to express it. You made it! It's the end of this post. I wanted to point a few of my favourite trends for this season! I hope you feel more inspired than you were when you started reading this post. 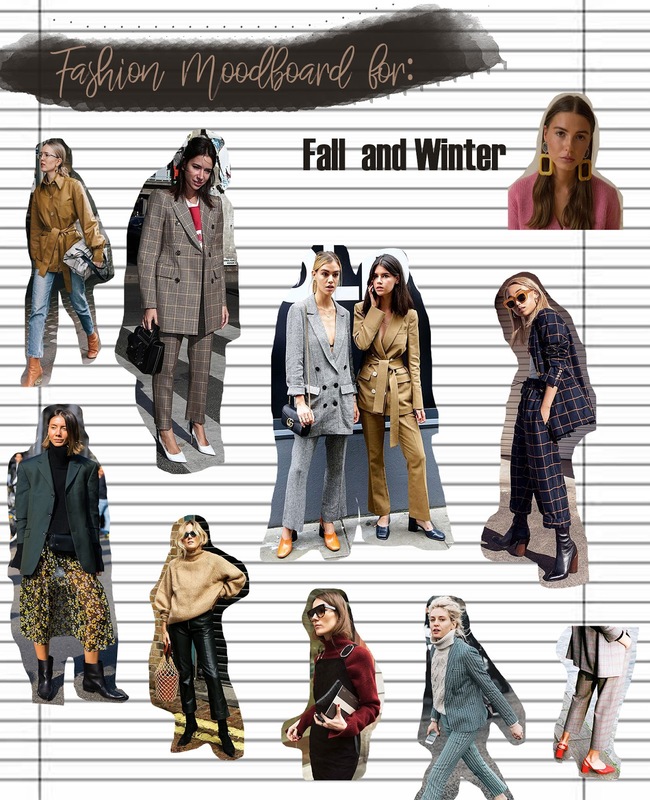 Let me know in the comments what are your favourite trends for fall and winter! 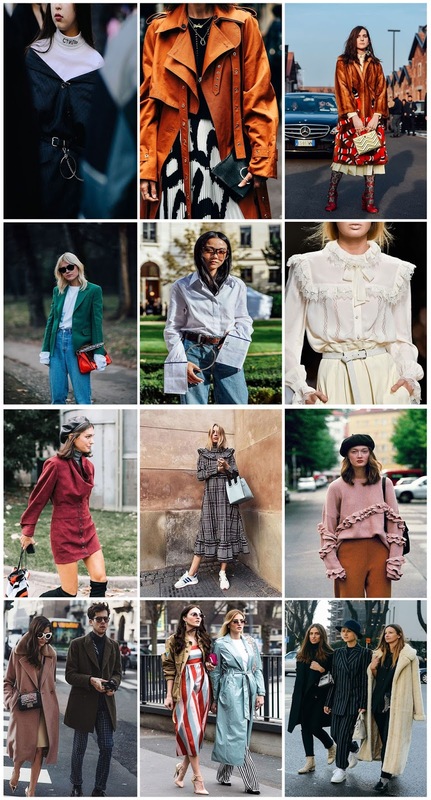 What are your favourite trends for fall and winter? Totally great idea. Love the "board" aspect of it. Very creative and fun. I'm assuming you would have one for all seasons! So many good options here. I'd say I most excited for shoulder pads....I know its so odd, but growing up I always wanted to wear them, but by the time I was old enough to dress myself they were no longer in style, so for them to be making a comeback has me so excited to wear the look and not be looked at like a goober. Great post, love your selection. I love fall and winter clothing. I love wearing Suits, they have their own charm and make me feel confident. Okay can I just say you made me feel like I'm a bit trendy? I just purchased a beret. I admit it was as part of my Halloween costume but I can totally see myself rocking it with a fun look this winter as well . . .
All these outfits are absolutely gorrgeous but I don't think I could pull them off - not sure why, just a feeling! Maybe I will have to get some sort of statement accessory! I'm loving the suited look. So chic and powerful. And how could anyone say no to a beret? They're fab with jeans and sweaters....and anything else you won! I love the pinks and reds. Such a pretty collection for fall! Everyone's wardrobe can use a little refresh for a new season. I love your site, and the moodboard. The jackets look so great! I love them- and the statement earrings- I wish I could try them all out! I love all of these vintage looks! This fall has been such a good season for these classic pieces. I've been falling in love with all of the soft colors and statement pieces. I could definitely see myself wearing these picks! Amazing moodboard! This is such a great, informative and inspiring post sweetie! I love all the vintage looks. I wish I can dress these fall styles, but Miami is still so hot for even a jacket. Can't wait for December and January to wear different clothing styles. Thanks for sharing, I will bookmark this post. Love it. I'm in fashion heaven! So many great options here....Let's see, what do I purchase first? Loving all the fall inspiration. I have to say, I was feeling very meh about fashion this past spring/summer, but fall is really starting to feel interesting! I especially love ruffly blouses! Such an awesome post! Totally in love with all of these great options. But I have to say that the one that caught my eye the most is shoulder pads. I remember trying them a few years ago and not being able to pull them off. However, I wasn't sure how to wear them. I'd really love to try to dress the up again! Leopard print has to be my absolute fav. I can't lie, I love anything leopard it's so stylish and chic! Thanks for sharing babe. I loved reading about it! Loving all your fall/winter inspo! Your picks are totally on point! I've always been about my statement shoes and earrings and leopard is always a fall favorite for me but I love that shoulder pads and suits are making a comeback. Love that 80s vibe! Screw the minimalism of the 90s that we keep seeing everywhere. More is more! I wish I had enough money to buy all the trends. I would like to get more statement earrings for next season. Thanks for inspiration. I never tried leopard clothes. hmmm maybe I need to buy a pair of heels. Moodboard!! This is the cutest I have ever seen. Such a good idea to gather all the inspo onto one vision board. Sometimes, when I wake up I have completely no idea what I want to wear or should wear for the day. It's nice to have a moodboard somewhere for inspo! Love those trend you have spotted girl! We are currently in spring but I love seeing what's going on on the other side of the world. Honestly, I would wear ever single outfit you have featured here on your mood board. I also must tell you that this is the best most inspiring mood board I've seen. Definitely inspired by it! I'm a bit fan of shoulder pads, vintage hats, and mixing all styles of print right now. So many of these looks you've included are a perfect example of how to do these trends. I love the overall mix of feminine and more masculine pieces. I love the way you did this inspiration post! My favorite trends are: vintage hats, suits and statement shoes! I feel like those things never get old. I think everyone was really into minimal jewelry for a long time and I'm actually excited to see statement earrings making a comeback! I pretty much threw all mine away from the 90s. Time to go shopping! I must say this is one of my favorite fall seasons. All the plaid, the oranges, the reds, all the way to the berets and faux fur! 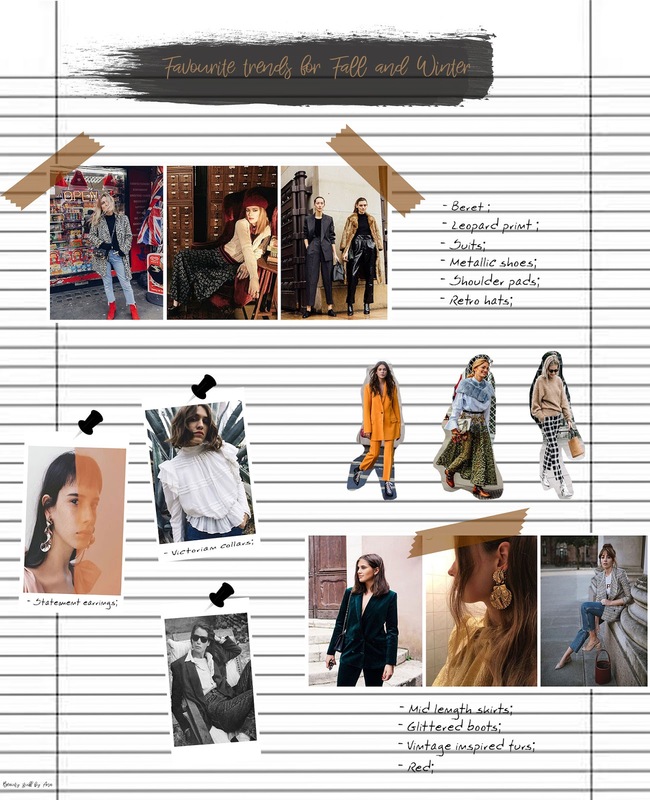 Your mood board has definitely given me some inspiration on some different looks to try. Next up on my list is a longline faux fur coat. I keep seeing them everywhere! I am loving your moodboard - so much inspiration and I can't wait to try a few of them out! My favourite season is fall (I love the changing colors of the leaves and the muted colors!) and I'm bookmarking this for reference!! Ahhh i really love fall and i adore all the selections and inspiration you shared with is here, it was so nice going thru it! Now, I'm in serious need of glittery boots..haha..thank you for the inspiration sweetie..
You've mentioned my favourite trend so far! I'm obsessed with suits, vintage hats, statement earrings and jewellery. I really love most of the trend this season, they are so feminine and strong at the same time. Thank you for the inso, really love all the pictures you've chosen!